Sunset rests on the dirty road, the clocks stop dead and the sky explodes. Satellite towns tend to breed big ambitions. Perched on the hills above Manchester, Macclesfield’s principle claim to fame comes in the cult of Ian Curtis. That classic example of the ‘just out of the city’ boy reinforces how big horizons tend to breed big ambitions. The Virginmarys are not part of the Curtis club. Their music blends the dynamics of platinum class ‘grunge’ (basically Nirvana, Mudhoney and Screaming Trees) with the spikiness of punk and the attention to detail and honesty of prime British rock of the early 1970’s, before the wizards and capes overcame the attack and dynamic. Their belief system begins with a devotion to the idea of playing. Live or in rehearsals, the three are at their most comfortable instruments in hand. Whether this is cool or not in a world where we sometimes seem to want our bands to devote themselves to studiously not playing is of no consequence to them. So, the debut album, ‘King Of Conflict’, was recorded live in the studio with Toby Jepson producing and Chris Sheldon (Pixies, Foo Fighters, Biffy Clyro, etc) at the mixing controls to capture the band at their thrilling best. But this is not ‘muso’ territory. Whilst Ally may have learnt his playing via a local blues maestro and lived in a house sound tracked by the likes of Fleetwood Mac, Free and The Allman Bros courtesy of his dad, the revelation of Nirvana and the digging backwards to punk and forwards to the diverse likes of Elbow and Arcade Fire meant that when Ally, Matt and Danny set out to write rock songs, those were never likely to be dumb, despite being a hell of a lot of fun. Further, Ally’s nature and his position as lyricist pretty much guaranteed that The Virginmarys would share much in common with those bands who eschewed the brainless cartoons of metal to create a rock music that used its words to deal with real life, real feelings and serious subjects. So a typical song from the trio rocks as hard as anything you are likely to hear but can talk about making the wrong calls despite yourself (‘Dead Man’s Shoes), domestic violence from the less thought out position of male as victim (‘Portrait Of Red’) and anti-capitalism (‘You’ve Got Your Money’). 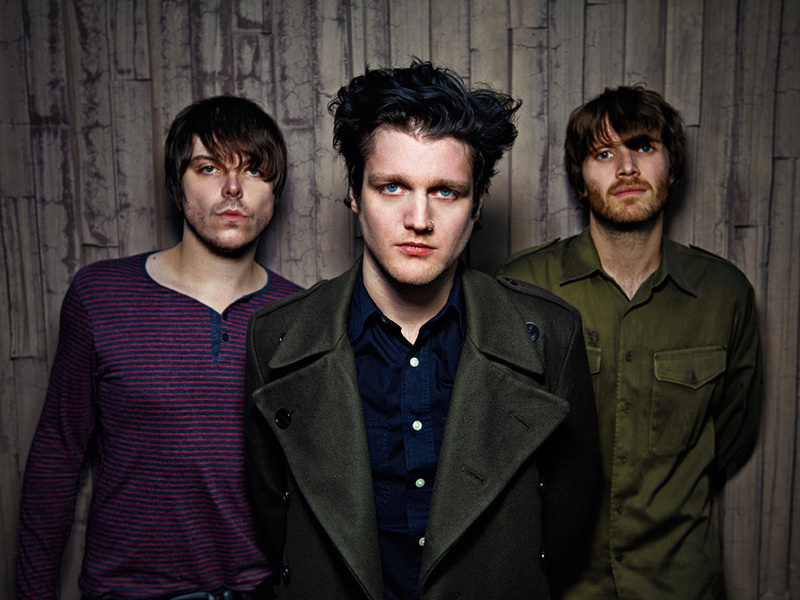 It’s that blend of rock schooling and intelligence that makes The Virginmarys such a thrilling proposition. Unlike so many contemporaries, the three are unlikely to fall into any of the obvious traps that bedevil young bands in their world. Having spent three years touring and playing alongside a series of self-released EP’s the band have built a fan base that encompasses the likes of Slash (a regular VM’s T shirt wearer), We Are Scientists, Eagles Of Death Metal and Ash, all of whom have invited the band to support them and thousands of devoted fans across the globe. In the process they have featured on BBC Breakfast, scored an iTunes single of the week both in the UK and US, had a track featured on Rockband 3 and sold out London’s Garage at a canter as part of HMV’s Next Big Thing series of shows at the close of 2011. Those beginnings have fostered a band that are ambitious without being arrogant, Ally claims that honesty is at the heart of everything he does, Danny wants The Virginmarys to be a catalyst for new bands to form and create great new music and Matt sees success as blowing away the dross that currently populates daytime radio and creating a world in which their music, and that like it, makes the music world an exciting place to be once more.